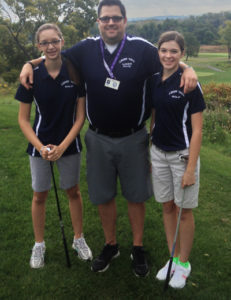 Putting – Either you’re a great putter or your putting gives you Heartache. These putters can improve your putting and make golf just that much more enjoyable and reduce your putts per round. Many of the Tour’s top putters (including Jordan Spieth) give the club a forward press before taking it back, but many pros have extra loft built into their putters. Tour players are tweaking their putters all the time, based on changing conditions of the greens and subtle changes in their mechanics. The pros have the luxury of “dialing in their putter”—and now you can too. If you are a tinkerer, or feel that you need a putter that can “be made to my specifications”, ADJUSTABILITY is the buzz/key word for putters currently on the market. Similar to the availability of adjustability in drivers, fairway woods, hybrids and even some irons, putters have come of age. One can adjust the lie angle, loft, offset, alignment and weight. A note regarding head weight: HEAD WEIGHT IS exactly what you think it is – how much does the putter head weigh? The best overall head weight for you is one that matches the speed of the majority of greens you play. If, however, you tend to play a number of different courses, then your best putter is the one that allows you to easily add weight or remove it. You are going to experience several different green speeds over the course of a year and you will need to have the ability to adjust. As a rule you should use a lighter-weight putter on slow greens and a heavier-weight putter on fast greens. When buying an adjustable putter, ensure that the weights are interchangeable and that a weight kit is included in the purchase. This kit allows you to change head weight on your putter to adjust to the speed of the green you are playing in a matter of seconds. Find the flattest part of the putting green. Putt 6 balls to the hole and observe the roll of each ball individually. Adjust the weights accordingly, so if your putts are coming up short of the hole, install a lighter weight. If your putts are going past the hole, install a heavier weight. Test to find the optimal weight for that day. Making it extremely easy to do this, is the Adjustable Happy Putter. Rather an unusual name to say the least, but its developers, Vikash Sanyal and Dave Cooper, of Odyssey and Never Compromise fame have developed another great putter. The Happy Putter, used by LPGA star, Stacy Lewis, offers complete adjustability. You can compensate for any tendencies in your stroke, or adjust it to match green conditions, or any tendencies that may be causing you to miss putts. Just “dial in” your putter to match green conditions on any given day. Three lie positions: Flat (68.0°), Standard (71.0°) and Up (74.0°). There are three lie-angle regulators — standard, up and flat — which give a range for a player to adjust the shaft, ranging from almost completely upright to back-bending flat. Two models are available, the Tour Series pointed Mallet and the Tour Series Mid Mallet, both available in stock lengths of 34” and 35”. Custom lengths are also available for an extra up charge of around $20. Now, if you are not adjustability challenged, these putters are amongst the best currently being used on Tour and are selling well at retailers. One of the most visibly shaped putters seen on the Tour currently (Henrik Stenson, Retief Goosen, Ian Poulter, Luke McDonald, Graeme McDowell, Aaron Baddeley and Kevin Kisner), is the Milled Collection RSX #7 Putter, a progressive shaped mallet with weighted alignment wings, a single-bend shaft and full-shaft offset. This putter delivers a crisp sound at impact, which ensures great feedback that matches up perfectly with the speed and roll off the face. Coupling this with Callaway’s patented Metal-X roll technology, the Roll and Sound eXperiment has come to life. The precision milled sound chamber pocket is set behind the 17-4 stainless steel striking surface for great feedback and feel. The 17-4 stainless steel insert has been chemically etched with Callaway’s patented oval pattern to provide a better roll off the face. The Stabilizing Crossbar helps stabilize sound and feel across the face as well. Another great feature is the Black Powder Coat shaft which substantially reduces glare and provides a unique, contemporary look. The use of a black genuine Cabretta leather Grip Master with a red baseball stitch down the back delivers a premium look with amazing feel. Another popular option seen on Tour is the Garsen grip (www.garsengolf.com) used by Henrik Stinson on his #7 putter. 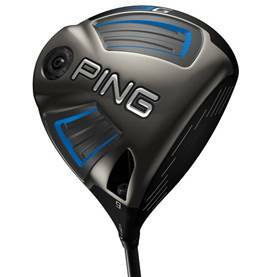 The head weighs 350 grams, has 3° of loft and a 70° lie angle. 33, 34 &35 inch shafts are available. Many golfers today are finding that oversized heads increase stability at impact, which keeps you more on line, for example, than a blade putter. 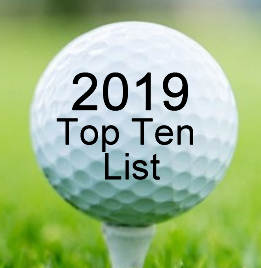 Obviously, with a higher MOI (Moment of Inertia), an expanded sweet spot, improved alignment system and combined with a milled insert, your putting should produce better results for you than your existing putter. At least, you should experiment with this type of putter. Highly recommended is TayorMade’s OS Spider model. 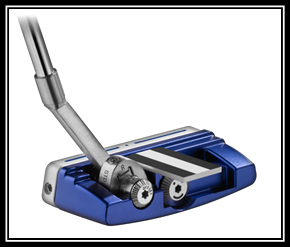 Aside from a clearly different color scheme than most putters, this 350 gram (head weight) putter employs a vertical, deep-milled insert (milled 6061 aluminum) that allows for better ball gripping, improved roll, sound and feel. 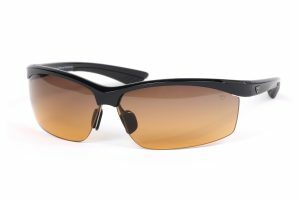 Its raised high contrast sight line will definitely make aiming much easier and, of course, the oversized head increases stability at impact. Many of our testing group were, to say the least, enthralled by the feel and accuracy of the putter, especially, how effortlessly it was to get the ball to the hole. 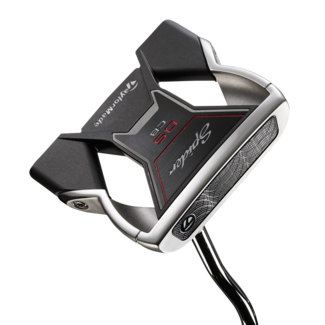 TaylorMade has two designations for the Spider- OS (Over Size) and CB (Counter Balance). The OS models feature slightly larger head sizes than traditional putters, while also delivering higher moment of inertia. For players seeking even more stability, the OS CB models are even larger in size, delivering higher moment of inertia and featuring counterbalance technology to stabilize and smooth the putting stroke. Bottom line: This putter can help inconsistent putters improve their alignment and develop a steadier, more dependable stroke. And it confidently swings through the ball with a concentrated, stable force. Available in both right and left hand models and lengths of 33, 34 and 35 inches and features a Super Stroke Mid – Slim 2. or 10.5” grip. Custom options regarding lie, loft and length are available and can be found on TaylorMade’s web site. This is Zach Johnson’s and Russel Knox’s favorite putter company. Once again this Franklin, Tennessee, based company has introduced a line of truly useful putters that simply makes sense and definitely lowers your putts per round. 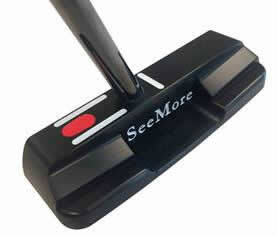 SeeMore has the RifleScope Technology (RST) Alignment System, that combined with this new 355g (head weight), 100% milled aluminum Giant M1t putter, provides not only an enlarged sweet spot that rolls putts just how you want on a consistent basis, but the resulting putts produce great results. It is almost intuitive when dialing in the proper length stroke for different distances! The well-balanced, center-shaft designed Giant M1t offers a more classic heel toe shape to appeal to a wider range of personal preferences in terms of confidence at set up. It is more forgiving, with a higher moment of inertia, and extreme heel/toe weighting, with milled copper sole weights that can be switched out to increase or decrease the overall head weight. SeeMore’s Patented RifleScope Technology (RST) Alignment System, delivers a True Reference Point for perfect alignment and set up on every putt. 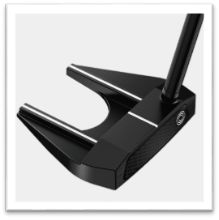 This putter is face balanced at impact or “balanced to plane”, meaning it’s dynamically balanced to the angle you putt and naturally returns to square at impact – less manipulation during the stroke to keep the putter face on the correct path. As well as the previous described putters, the Giant M1t can help inconsistent putters improve their alignment and develop a steadier, more dependable stroke. Odyssey continues to introduce new and excellent putters that perform. Their new Toe Up line features two models: #1 (blade) and #9 (half-mallet). The name is based on how these models orient themselves “toe up” when balanced on the shaft vs. the “toe down” or “face-balanced” orientations found on most putters. What is radically different and what may take a little practice to get used to, is the feel and set up of the putters. A slightly onset shaft seems odd at first address, and the weighting and feel of the club is unlike any putter you’ve held. Odyssey’s new putters are balanced so the toe of the club head points up when balanced horizontally. The idea of this design is to reduce torque and minimize twisting in the hands to deliver a truly square and consistent impact. In order to achieve this, Odyssey has aligned the shaft with the center of gravity in the clubface (and slightly toward the toe), which allows the putter to travel straight back and through like a pendulum, without rotation. As a result, this putter may be more beneficial to players employing a straight back and through putting stroke, rather than a slightly arched stoke. Additionally, and according to Odyssey, while Toe Up putters are cast, not milled, they have the same chemically etched ovals on their club faces that help increase friction at impact, giving the ball a better roll. The Odyssey Toe Up #1 Putter, shown below, is a squared flange blade, with a sole cavity, slight onset and a stroke balanced design. The head weighs 355 grams, has 3° of loft and a 70° lie angle. 33, 34 &35 inch shafts are available. Most putters today have centers of gravity (CG) that are pushed back from the face through perimeter weighting or higher moment-of-inertia designs. The downside can mean that the center of gravity is behind the hands during the stroke leading to an innate tendency to resist rotating the face open and closed. In Odyssey’s Toe Up putters much of the weight of the head is hogged out of the sole, concentrating the mass toward the front of the club head. In addition, the shaft had to be adjusted slightly. Keeping the CG toward the face is another reason the Toe Up putters don’t feature the trademark Odyssey insert, which is lighter than the surrounding steel. 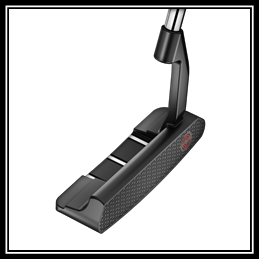 Instead, the milled face features a pattern of tiny ovals that have been chemically etched, much like what was seen on the Metal-X Milled putters. This pattern creates friction with the ball at impact for more consistent roll. 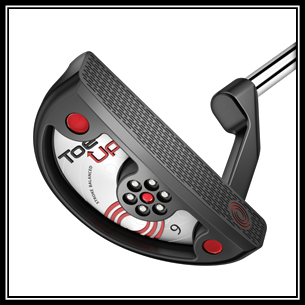 The Odyssey Toe Up #9 Putter (shown below) is a rounded flange blade, with a sole cavity, slight onset and a stroke balanced design. The head weighs 355 grams, has 3° of loft and a 70° lie angle. 33, 34 &35 inch shafts are available. Both models employ the most visible putter grip on all Tours – the SuperStroke. SuperStroke’s main USP (Unique Selling Proposition) is to eliminate the twisting of the hands and wrists throughout the stroke. Both models use SuperStroke’s Flatso 1.0 Countercore grip. This grip helps eliminate the hands and wrists by strategically adding weight to employ the larger muscles in the shoulders and back, which furthers the cause to create a smooth, pendulum-style stroke. A larger and non-tapered grip, according to SuperStroke, distributes grip pressure evenly. SuperStroke offers 7 versions and sizes of the Flatso grip. The 3 white line Hi-Def alignment system falls into place once your eyes adjust, and the foreign weighting of the club soon starts to feel comfortable. The lines absolutely pop off the Charcoal PVD finish. This hi-def system lets you setup perfectly to the ball. These putters are ideal for those golfers who struggle with squaring the putter through the stroke, particularly at impact. While this can be true for both golfers with a “straight-back-straight-through” stroke and an “inside-to-square-to-inside” stroke, Odyssey’s low-torque weighting and the use of SuperStroke’s hand-eliminating grips, may be more appealing to the players employing the former, a pendulum-type putting stroke. Whichever putter you decide on, take the time to be fitted to your specifications. Doing so will eliminate doubts, improve your confidence, and help you make more putts! 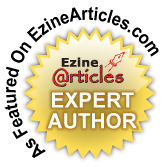 This entry was posted on Saturday, October 15th, 2016 at 1:31 pm and is filed under Golf Equipment Reviews. You can follow any responses to this entry through the RSS 2.0 feed. Both comments and pings are currently closed.